To encourage students to become more successful in their academic endeavors and in the VHMS 8th Grade Integrated Science Course, the following changes have been implemented and will take effect immediately. These program changes will replace the Essential Mastery Test portion of the current Grading Section found in the Disclosure Document. In our new remediation program, students have an opportunity to remediate and retake the current test once for a chance of earning a possible higher score during the 1st week only (Equivalent to 4 TEAL Days). However, after their first retake, the test score in Skyward can and will be dramatically affected. For a student to achieve mastery on their test, he/she must achieve a score of 80% or higher. After the initial retake, the grade the student receives in Skyward will be based on the number of times he/she comes in for remediation to master the test. The test will be available for retake/remediation for only 3 weeks (Equivalent to 12 TEAL days). ​Remediation will be carried out as a collaborative effort, meaning that your student may remediate with other 8th grade science teachers. Accommodations will still be in effect to help your student succeed. 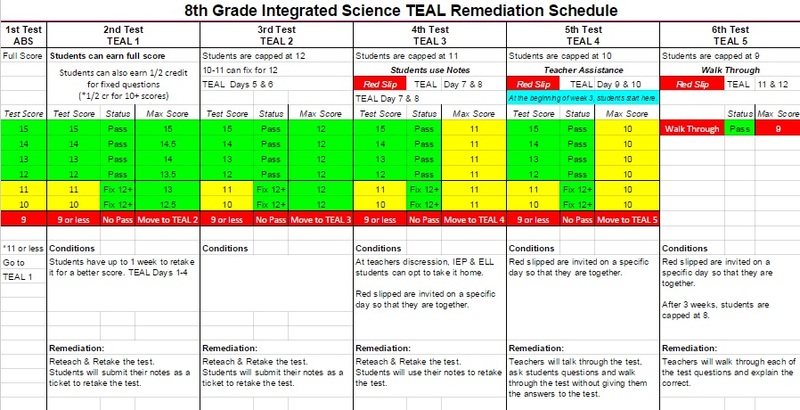 For further details outlining this new TEAL Remediation Program, please go to http://vhmsscience.weebly.com/teal-time-remediation.html, or contact your student’s VHMS 8th grade science teacher. 60% or less: The highest earned score in Skyward will be based on the first test administration and the top of three scores during TEAL. 60% to 70%: The highest earned score in Skyward will be based on the first test administration and the top of two scores during TEAL. 70% and above, the scores will be based on the TEAL Remediation Program written below. Students who did pass - can retake it for a better score within 1 week from the test date (equivalent of 4 TEAL days). Remediation: Reteach & Retake the test - Students will submit their notes as a ticket to retake the test. Pass: Full Score in Skyward with the option to fix any missed questions for ½ credit. Students have 1 week from the retake date to fix the missed questions. Not Pass (10-11): ½ Credit for correcting the missed answers with additional because statements justifying the 2nd answer chosen. Students have 2 TEAL days from the retake date to fix the missed questions. If they fail to return within 2 TEAL days - they automatically move to TEAL 2. Not Pass (1-9) – Students must remediate and are moved to TEAL 2. This stage will automatically start TEAL Day 1-4. Pass: Score is capped at 12 in Skyward. Scores are capped at 12 in Skyward. This stage will automatically start TEAL Day 5-6. Students must use their notes during the retake. Pass: Score is capped at 11 in Skyward. Not Pass (10-11): Students have the option to fix any missed questions. This stage will automatically start TEAL Day 7-8. Teacher assistance is where a teacher reads & assists the student with finding the answer - but does not give the final answer. Remediation: Teachers will talk through the test, ask students questions and walk through the test without giving them the answers to the test. Pass: Score is capped at 10 in Skyward. This stage will automatically start TEAL day 9-10. Test Walk Through is where a teacher, student aide or parent goes step by step through the test and explains the why behind the correct answer. Remediation: Teachers will walk through each of the test questions and explain the correct. Pass: Score is capped at 9 in Skyward. This stage will automatically start TEAL day 11-12. Students who ignore the RED SLIPS for TEAL will be given a score of 8. NO EXCEPTIONS. Names will be submitted to administration for follow up. The test will no longer be available for a student to retake.